She has 3 dogs, and it’s been amazing that from day 1, all 5 of our dogs have interacted without incident. We tried to foster a dog twice in Austin, and both times, our dogs were complete assholes to the foster, making it so that we had to return the dog to the shelter. The house has grass, a dog door, and the yard is completely fenced in, and safe that the dogs won’t accidentally get out. So this weekend we wanted to go to Isla Mujeres because we had friends who were visiting the island. We wanted to see them, but didn’t want to drag the dogs with us. Would Mrs. Roper do it? I mean, I’m sure she would. We’d totally be willing to watch her dogs for as long as she needed us to. But we’ve only been here for just over 2 weeks! That’s kind of a big ask. So we brought it up & she offered. Bessie gets separation anxiety when she’s alone. She’s not destructive, but certainly annoying to anyone who can hear her. When we first got her, neighbors thought that we were abusing her, and the little boy down the street thought she was a cow mooing. So, we were a little worried about leaving the dogs – especially since it’s overnight, the first time living in Mexico. On Sunday morning I got a message from Mrs. Roper: Sadie had a cut on her back leg. She had gone out for a few hours the night before, and didn’t know what had happened. She thought it needed stitches. She had called a few vets, and one could see her at noon. Had the dogs finally had their kerfuffle now that they’d had their chance? Had one of the other dogs hurt her? Sadie’s plays pretty hard. There were a number of times when we brought her home from the dog park, and she was bleeding. But she’d never needed stitches before. How much was this going to cost? We got home from the island about mid-afternoon. Shortly after, Mrs. Roper came home saying that Sadie was out of surgery & she’d just gotten a call from the vet – we could pick her up. The vet had required a deposit before she’d do the surgery, so Mrs. Roper paid her 500 pesos (~$25). She had also picked up her medication – 190 pesos (less than $10). Gary handed me a wad of cash & we left to pick her up. In the front area, there was a girl behind a counter with a cash register. It may have been 8-10 feet wide, and about 5 feet deep. There were all sorts of pet supplies in the front area – food, collars, toys, leashes, etc. for both dogs and cats – all organized, clean and not too crowded. Behind the counter, there was a window to the exam room, and to the far right of the storefront, a door to the exam room. The exam room was about the same size. The vet was young, and cleaning off her exam table. She was wearing scrubs, and asked me if I spoke Spanish. My response: ‘Un poquito’, while at the same time, I raise my hand, and narrow my thumb and forefinger within an inch of one another. She only spoke to Mrs. Roper after that. I understood very little. Sadie’s wound was much larger than I was expecting. It travelled along the inside of her groin from her hip down about 4-5 inches. She was in a pet carrier on the floor that was completely rusty. The salt air destroys everything. Not 24 hours after we arrived, did the dog’s collars start to rust. She was lethargic from anesthesia. Mrs. Roper had brought a cone of shame with her, but it was too small, so I’d have to buy one. So after what seemed like a long conversation about what the vet had done, and instructions on what to do going forward, I was asked to pay the balance of the bill. Before I disclose how much I paid for this, let me ask you, how much do you think you would have paid for this in the states? A year or so ago, we had brought Wookie in to the vet because she’d been bitten by another cat. The wound had healed and was abscessing. That was on a week-day. I think that cost around $800. In this case, it was a Sunday. Sadie was put under with anesthesia, and had 10-15 stitches. The remaining balance was 450 pesos – and that included the cone of shame (150 pesos)! So, the total for the surgery was 800 pesos. The cone of shame was 150 pesos. The medicine was 190 pesos. Grand total? 1140 pesos. (which is roughly $60). So, we need to bring her back to the vet in a few days to get her stitches checked, and then in about a week to have them removed. I’m curious about whether those visits will have fees associated with them. Wow! 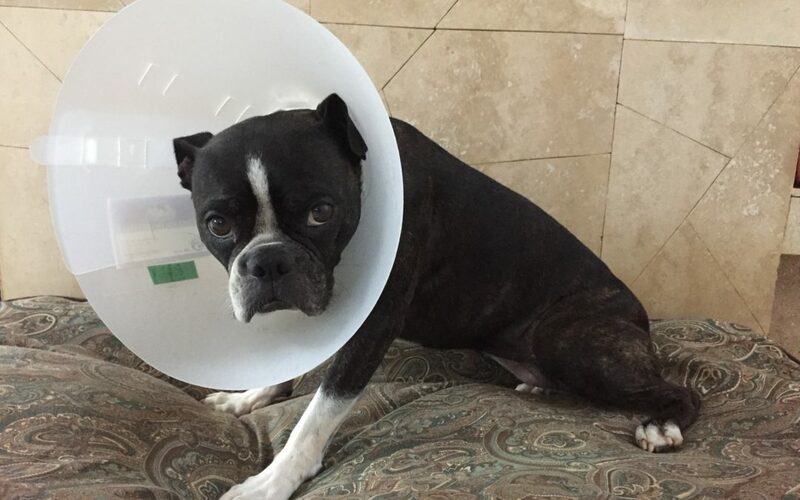 As we will be coming down with our pets as well, your story about Sadie’s misadventure and her unexpected trip to the vet relieved some of my nervousness about vet care. I have insurance here in FL for my dog but I’m guessing that won’t be an option once we move. Tell Sadie we’re hoping she’s doing better and she did a big service for future expat pooches. Sadie is now completely healed and doing great. Her follow up vet visits to check on her wound as it was healing were great as well. I think we went back 3 times. First time was free. 2nd time was 50 pesos. And the third time, when they took out her stitches, was 100 pesos. We also went to a different vet a couple weeks ago to have Bessie’s teeth cleaned. The cleaning was about 900 pesos, and meds (pain mess and antibiotics) were around 400 pesos. So far we’ve been very happy with the vet services, and the costs are super cheap, compared to the US.